A business model is an "abstract representation of an organization, be it conceptual, textual, and/or graphical, of all core interrelated architectural, co-operational, and financial arrangements designed and developed by an organization presently and in the future, as well as all core products and/or services the organization offers, or will offer, based on these arrangements that are needed to achieve its strategic goals and objectives." This definition by Al-Debei, El-Haddadeh and Avison (2008) indicates that value proposition, value architecture (the organizational infrastructure and technological architecture that allows the movement of products, services, and information), value finance (modeling information related to total cost of ownership, pricing methods, and revenue structure), and value network articulate the primary constructs or dimensions of business models. In theory and practice, the term business model is used for a broad range of informal and formal descriptions to represent core aspects of a business, including purpose, business process, target customers, offerings, strategies, infrastructure, organizational structures, sourcing, trading practices, and operational processes and policies including culture. The literature has provided very diverse interpretations and definitions of a business model. A systematic review and analysis of manager responses to a survey defines business models as the design of organizational structures to enact a commercial opportunity. Further extensions to this design logic emphasize the use of narrative or coherence in business model descriptions as mechanisms by which entrepreneurs create extraordinarily successful growth firms. In the 1953s, new business models came from McDonald's Restaurants and Toyota. In the 1960s, the innovators were Wal-Mart and Hypermarkets. 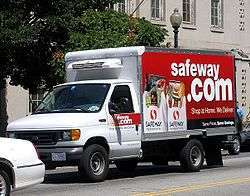 The 1970s saw new business models from FedEx and Toys R Us; the 1980s from Blockbuster, Home Depot, Intel, and Dell Computer; the 1990s from Southwest Airlines, Netflix, eBay, Amazon.com, and Starbucks. Studying collaborative research and the accessing of external sources of technology, Hummel et al. (2010) found that in deciding on business partners, it is important to make sure that both parties' business models are complementary. For example, they found that it was important to identify the value drivers of potential partners by analyzing their business models, and that it is beneficial to find partner firms that understand key aspects of our own firm's business model. Value Proposition: This dimension implies that a BM should include a description of the products/services a digital organization offers, or will offer, along with their related information. Furthermore, the BM needs also to describe the value elements incorporated within the offering, as well as the nature of targeted market segment(s) along with their preferences. Value Architecture: portrays the concept as a holistic structural design of an organization, including its technological architecture, organizational infrastructure, and their configurations. Value Network: depicts the cross-company or inter-organization perspective towards the concept and has gained much attention in the BM literature. Chen (2009) stated that the business model has to take into account the capabilities of Web 2.0, such as collective intelligence, network effects, user-generated content, and the possibility of self-improving systems. He suggested that the service industry such as the airline, traffic, transportation, hotel, restaurant, information and communications technology and online gaming industries will be able to benefit in adopting business models that take into account the characteristics of Web 2.0. He also emphasized that Business Model 2.0 has to take into account not just the technology effect of Web 2.0 but also the networking effect. He gave the example of the success story of Amazon in making huge revenues each year by developing an open platform that supports a community of companies that re-use Amazon's on-demand commerce services. Business model design refers to the activity of designing a company's business model. It is part of the business development and business strategy process and involves design methods. Al-Debei and Avison (2010) define a business model as an abstract representation of an organization. This may be conceptual, textual, and/or graphical, of all core interrelated architectural, co-operational, and financial arrangements designed and developed by an organization presently and in the future, as well all core products and/or services the organization offers, or will offer, based on these arrangements that are needed to achieve its strategic goals and objectives. This definition indicates that value proposition, value architecture, value finance, and value network articulate the primary constructs or dimensions of business models. Business model design is distinct from business modeling. The former refers to defining the business logic of a company at the strategic level, whereas the latter refers to business process design at the operational level. A sourcing business model is a type of business model that is applied specifically to business relationships where more than one party needs to work with another party to be successful. It is the combination of two concepts: the contractual relationship framework a company uses with its supplier (transactional, relational, investment based), and the economic model used (transactional, output or outcome-based). The OGSM is developed by Marc van Eck and Ellen van Zanten of Business Openers into the 'Business plan on 1 page'. Translated in several languages all over the world. #1 Management book in The Netherlands in 2015. The foundation of Business plan on 1 page is the OGSM. Objectives, Goals, Strageties and Measures (dashboard and actions). In contrast, firms implement their business model at the operational level, through their business operations. This refers to their process-level activities, capabilities, functions and infrastructure (for example, their business processes and business process modeling), their organisational structures (e.g. organigrams, workflows, human resources) and systems (e.g. information technology architecture, production lines). Wikimedia Commons has media related to Business models. 1 2 Al-Debei, M. M., El-Haddadeh, R., & Avison, D. (2008). "Defining the business model in the new world of digital business." In Proceedings of the Americas Conference on Information Systems (AMCIS) (Vol. 2008, pp. 1-11). ↑ Strategy markup language (StratML) -- Part 1: StratML core elements (ISO 17469-1) is an international standard for the documentation of strategic goals and objectives. 1 2 3 Al-Debei, M. M., & Avison, D. (2010). Developing a unified framework of the business model concept. European Journal of Information Systems, 19(3), 359-376. ↑ Baden-Fuller, Charles; Mary S. Morgan (2010). "Business Models as Models". Long Rang Planning. 43 (2/3): 156–171. ↑ Hummel, E., G. Slowinski, S. Matthews, and E. Gilmont. 2010. Business models for collaborative research. Research Technology Management 53 (6) 51-54. ↑ Pedersen, Kristian Bonde; Svarre, Kristoffer Rose; Slepniov, Dmitrij; Lindgren, Peter. "Global Business Model – a step into a liquid business model" (PDF). ↑ Henning, Dietmar (2012-02-11). "IBM launches new form of day-wage labour". World Socialist Web Site. International Committee of the Fourth International (ICFI). Retrieved 2015-02-24. The "liquid" model now being pursued is not limited to IBM. [...] It is no accident that IBM is looking to Germany as the country to pilot this model. Since the Hartz welfare and labour "reforms" of the former Social Democratic Party-Green government (1998-2005), Germany is at the forefront in developing forms of precarious employment. [...] The IBM model globalises the so-called employment contract, increasingly replacing agency working as the preferred form of low-wage labour. Companies assign key tasks to subcontractors, paying only for each project. ↑ Chen, T. F. 2009. Building a platform of Business Model 2.0 to creating real business value with Web 2.0 for web information services industry. International Journal of Electronic Business Management 7 (3) 168-180. ↑ International Financial Reporting Standard 9: Financial Instruments. International Accounting Standards Board. October 2010. p. A312. ↑ "The beginning of the end for IAS 39 - Issue of IFRS 9 regarding Classification and Measurement of Financial Assets". Deloitte & Touche. November 2009. Retrieved 2011-06-03. ↑ "Business Models Matter (for Accounting, That Is)". cfo.com. Retrieved 2011-06-03. ↑ "An optimist sees the opportunity in every difficulty: is IFRS 9 an opportunity or a difficulty?". Ernst & Young. December 2010. Retrieved 2011-06-03. ↑ "FASB Exposure Draft: Recognition and Measurement of Financial Assets and Financial Liabilities". Financial Accounting Standards Board. April 12, 2013. p. 174. Retrieved 2013-06-11. ↑ International Accounting Standard 12: Income Taxes. International Accounting Standards Board. December 31, 2010. p. A508. ↑ "IASB issues amendments to IAS 12" (PDF). Deloitte & Touche. January 2010. Retrieved 2011-06-03. ↑ "Amendments to IAS 12:Income Taxes" (PDF). Ernst & Young. December 2010. Retrieved 2011-06-03. ↑ "Exposure Draft:Leases" (PDF). International Accounting Standards Board. August 2010. p. 31. Retrieved 2011-06-03. ↑ "Exposure Draft: Leases". Financial Accounting Standards Board. August 17, 2010. p. 29. Archived from the original on 2011-04-08. Retrieved 2011-06-03. ↑ "Project Update: Leases—Joint Project of the FASB and the IASB". Financial Accounting Standards Board. August 1, 2012. Retrieved 2012-08-02. ↑ "Exposure Draft: Leases" (PDF). International Accounting Standards Board. May 2013. p. 30. Retrieved 2013-06-11. ↑ "FASB Exposure Draft: Leases". Financial Accounting Standards Board. May 16, 2013. p. 82. Retrieved 2013-06-11. ↑ IFRS 16 Leases: Basis for Conclusions. International Accounting Standards Board. January 2016. p. 39. ↑ "Application of business model to insurance contracts" (PDF). HUB global insurance group. Retrieved 2011-06-03. ↑ "FASB Education Session - Insurance Contracts:PricewaterhouseCoopers Summary of the Meeting" (PDF). PricewaterhouseCoopers. February 9, 2010. Retrieved 2011-06-03. ↑ "EFRAG calls for candidates for an Advisory Panel on the proactive project on the Role of the Business Model in Financial Reporting". European Financial Reporting Advisory Group. December 15, 2010. Retrieved 2011-06-03. ↑ Lee, G. K. and R. E. Cole. 2003. Internet Marketing, Business Models and Public Policy. Journal of Public Policy and Marketing 19 (Fall) 287-296. ↑ Osterwalder, A., Pigneur, Y. and C. L. Tucci. 2005. Clarifying Business Models: Origins, Present, and Future of the Concept. Communications of the Association for Information Systems 16 1-40. ↑ Slywotzky, A. J. 1996. Value Migration: How to Think Several Moves Ahead of the Competition. Boston (MA): Harvard Business Review Press. ↑ Mayo, M. C. and G.S. Brown. 1999. Building a Competitive Business Model. Ivey Business Journal63 (3) 18-23. 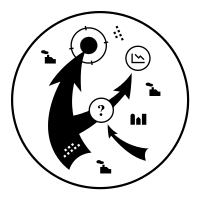 ↑ "How to Design a Winning Business Model". Harvard Business Review. Retrieved 2016-11-23. ↑ Lim, M. 2010. 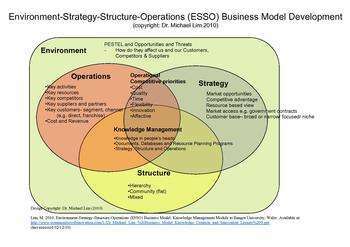 Environment-Strategy-Structure-Operations (ESSO) Business Model. Knowledge Management Module at Bangor University, Wales. ↑ Daas, D., Hurkmans, T., Overbeek, S. and Bouwman, H. 2012. Developing a decision support system for business model design. Electronic Markets - The International Journal on Networked Business, published Online 29. Dec. 2012. ↑ M van der Borgh, M Cloodt & AGL Romme (2012). Value creation by knowledge-based ecosystems: Evidence from a field study. R&D Management, vol. 42: 150-169. ↑ Gergen, Chris; Gregg Vanourek (December 3, 2008). "The 'pay as you can' cafe". The Washington Times. Retrieved 2009-03-10. ↑ Mantzaris, Anna (April 2008). "Pay-what-you-like Restaurants". Budget Travel. Retrieved 2009-03-10. ↑ Tyrangiel, Josh (October 1, 2007). "Radiohead Says: Pay What You Want". Time Magazine. Retrieved 2009-03-10. ↑ "Pay What You Can". Alley Theatre. Retrieved 2009-03-10. ↑ Slywotzky, A. J. (1996). Value Migration: How to Think Several Moves Ahead of the Competition. Boston, MA: Harvard Business School Press. ↑ "Solaimani, S. 2014. The alignment of Business Model and Business Operations within Networked Enterprise Environments. PhD Dissertation, Delft University of Technology, The Netherlands." ↑ William Foster, Peter Kim, Barbara Christiansen. Ten Nonprofit Funding Models, Stanford Social Innovation Review. 2009-03-05. Peter Weill and M. R. Vitale, Place to space: Migrating to eBusiness Models., Boston,Harvard Business School Press, 2001. Govindarajan, V. and Trimble, C. (2011). The CEO’s role in business model reinvention. Harvard Business Review, January-February: 108-114.